While there haven’t been any official announcements regarding The Mars Volta’s upcoming LP yet, the band is currently on tour, premiering live versions of their new songs, and we’ve got the scoop for you. 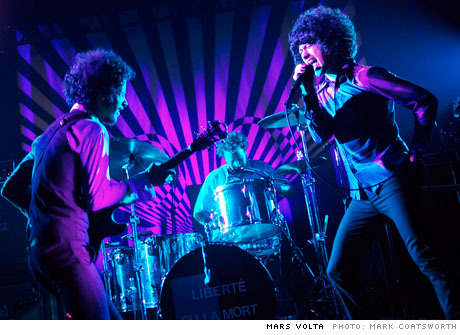 The Mars Volta are set to tour the US later this month, supporting Soundgarden. Reunited Seattle grunge legends SOUNDGARDEN kicked off their first full-fledged tour in 14 years Saturday, July 2 at the Molson Ampitheatre in Toronto, Ontario, Canada. Opening acts on various dates will be COHEED AND CAMBRIA, QUEENS OF THE STONE AGE, MASTODON, THE MEAT PUPPETS and THE MARS VOLTA. SOUNDGARDEN reunited last year and issued its first concert set in March, titled “Live On I5”. The disc was recorded on a West Coast tour shortly before the group disbanded in 1997.